Pork chops are a nutritious choice for any mealtime. One loin chop contains less than 200 calories and is full of protein and vitamins and minerals such as thiamin and selenium. Grilling your meat on the George Foreman grill helps to reduce fat because the excess fat drips off the meat as you cook it. The grill also keeps your pork chops tender and seals in moisture so you don't have to add any excess oil or butter while cooking. Add a side of vegetables to our meal if you wish and place the sliced vegetables, such as onions or green peppers, on a unheated George Foreman grill. Plug in the grill, close the lid and allow it to preheat. This should take approximately 10 minutes -- the indicator light will go off once the grill is ready. Sprinkle your pork chops with seasonings such as salt, pepper or seasoning salt. Push your vegetables to the side of the grill and arrange your pork chops on the center of the grill plate. Top the chops with a few sprigs of fresh herbs, such as oregano or thyme. Close the grill and cook the pork chops for four to six minutes or until completely done. Keep the lid on at all times during the cooking process to ensure that your pork chops stay juicy and moist. Allow the chops to rest for at least five minutes before you serve or cut into them to prevent the meat’s juices from flowing out. Undercooked meat can contain dangerous bacteria such as E. coli and salmonella. 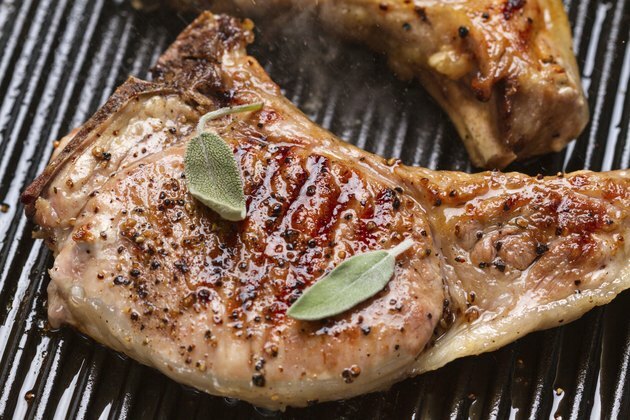 Cook your pork chops until the internal temperature reads 145 degrees when measured with a meat thermometer.